Sunday, February 23 1908 -- A huge Herriman cartoon snakes around a full page article about Frank Wiggins, the head man at the Los Angeles Chamber of Commerce. Wiggins is an indefatigable booster for L.A. and southern California, and the Herriman vignettes illustrate various tales Wiggins tells of the 'old days' in L.A. (by which he means a whole 20 or so years ago). At the bottom, we have Wiggins himself about to introduce the residents of Whittier to the citrus trade. At top left we have 'touridents', Wiggins' name for tourists who become residents, in the top middle there is the old Zanja aqueduct, and at right, memories of cheap land and wildlife hanging around downtown. 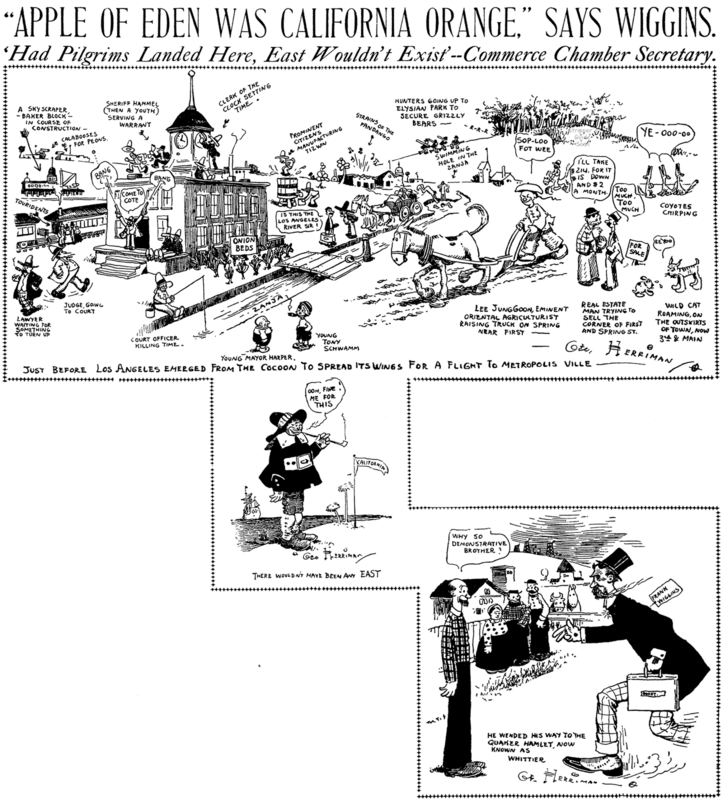 In 1913 the McClure Syndicate was having a heck of a time getting and retaining cartooning talent, as the market for their readyprint Sunday comic sections was rapidly drying up. Most McClure sections of this period are populated with lackluster material and reprints of material from as long ago as 6-8 years earlier. 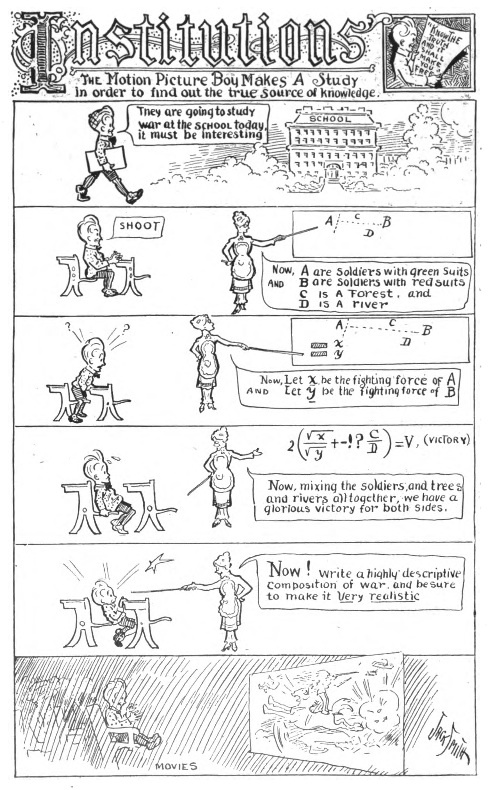 Into this mess walked French-Canadian cartoonist Raoul Barre, who was soon to become a leading light in early animation. 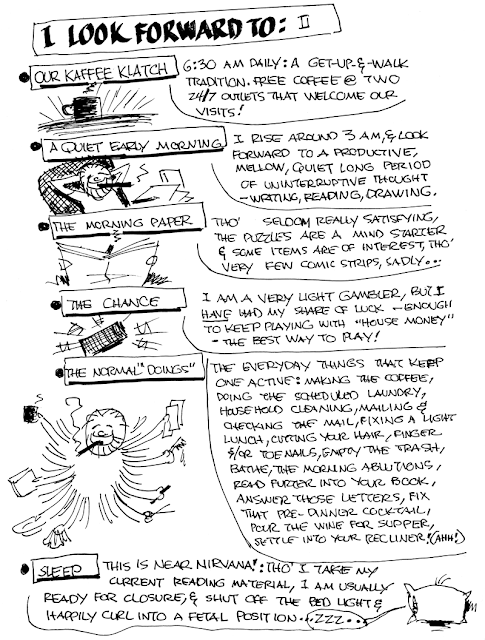 The details of why and how he came to be associated with McClure are unknown to me, but he was obviously not anxious to let the world know he was penning a strip for McClure. 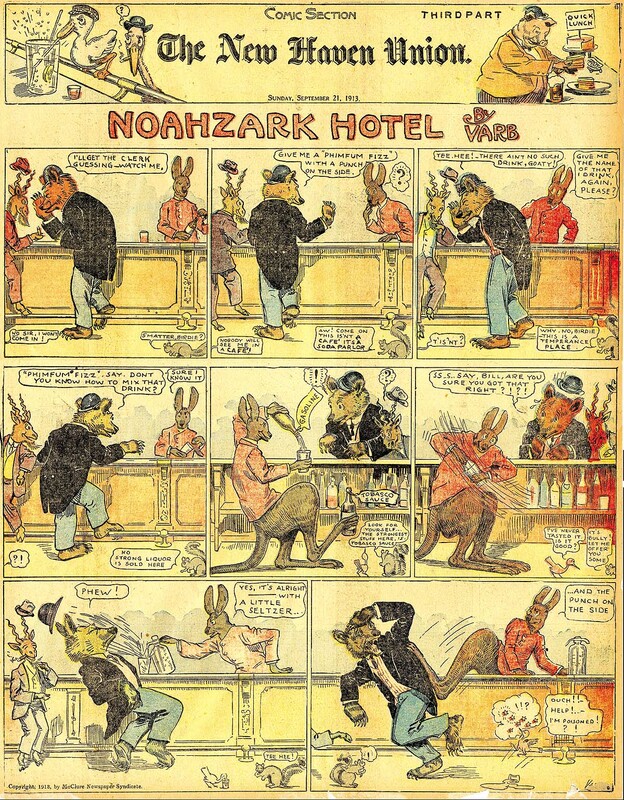 Hence Noahzark Hotel, his only known U.S-syndicated comic strip, is signed Varb, an acronym for his full name, Vital Achille Raoul Barre. The strip, as the name implies, is about a hotel whose staff and customers are animals. 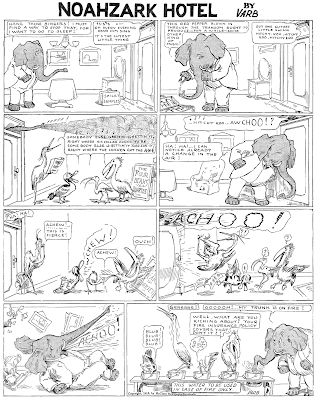 The theme is put to good use in many of the strips, with the species of the animals dictating the action, which tends to the playfully and pleasingly frantic. The quality of the drawing varies quite a bit from week to week, but the strips are always attractive on the page, with shortcomings only apparent on closer study. 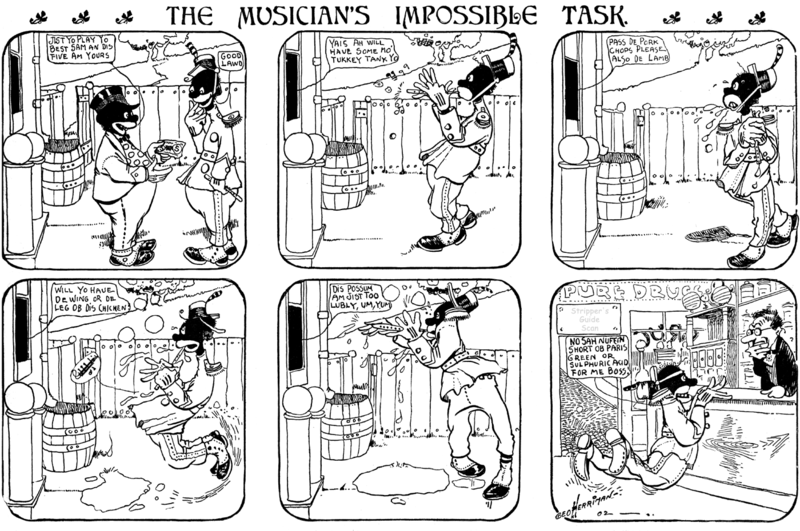 Perhaps the less well-drawn strips were due to Barre's no doubt busy schedule in this period. He was already working at the Bray Studios on their very earliest animated shorts, the first of which was released in June of this year. 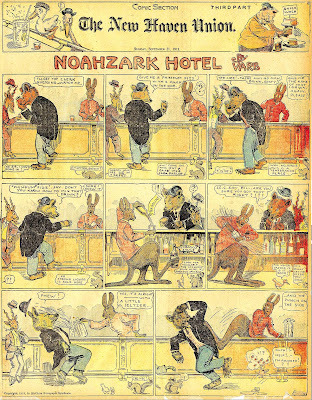 Barre produced Noahzark Hotel for almost a full year, from January 12 to November 9 1913. Thanks to Cole Johnson who supplied the samples! Charles Desaix Small was born on February 21, 1882, according to his World War I draft card. The Times Record (Troy, New York) said, on February 18, 1953, he was a native of Philadelphia, Pennsylvania. He has not been found in the 1900 U.S. Federal Census. Information about his education and art training has not been found. In 1910 he was married to Katherine (also spelled Catherine and Katheryn in subsequent censuses) and lived in Troy, New York at 10 13th Street. He was a clerk at a freight office. He signed his World War I draft card on September 12, 1918. His description was short height, medium build with hazel eyes and black hair. They remained at the same address in 1920. Their son Charles was nine months old. Small worked as a railroad clerk. 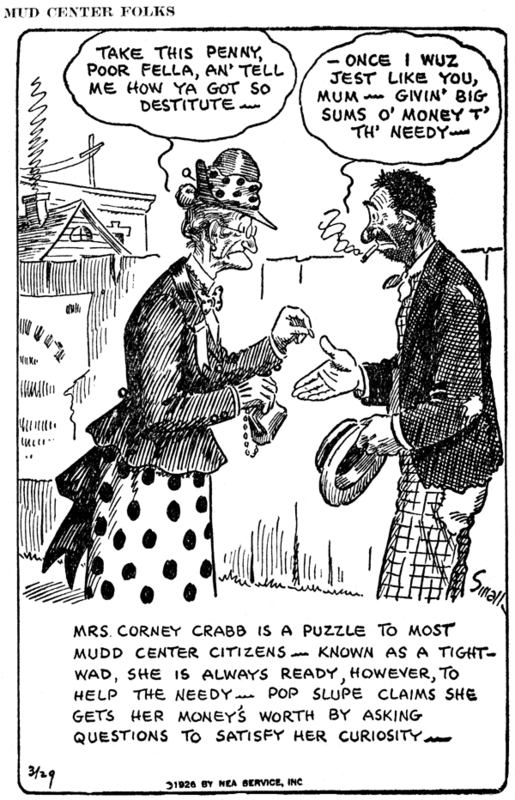 Some of the strips he worked on were Mudd Center Folks (1925), Bugs (1926–1927), and Salesman Sam (1927–1936). The date of his move to Ohio is not known. The 1930 census recorded him in Lakewood, Ohio at 1240 Brookley Avenue. His occupation was comic artist for a news "jernal". The census said he married when he was 25 (around 1907). The date of his return to Troy, New York is not known. 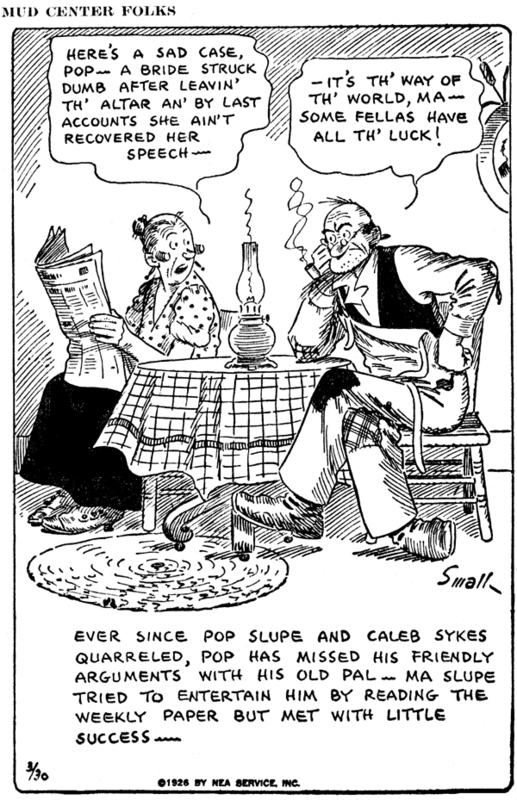 Polk's Troy City Directory 1947 had a listing for him, "Small Chas D (Kath) cartoonist h 793 2d av Lans". Small passed away on February 18, 1953. The Times Record reported his death later that day. 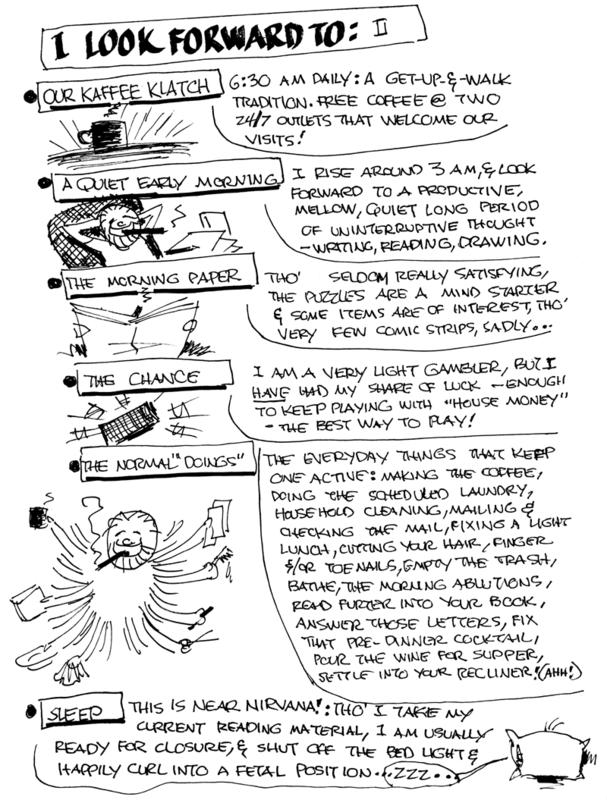 Charles DeSaix Small of 793 Second Avenue, commercial cartoonist, died at his home early today after a short illness. He was a native of Philadelphia, Pa., and was a member of St. Barnabas' Episcopal Church. Survivors include his widow, the former Kathryn Chase; a son, Charles Small of Closter, N.J., and a brother, Emile S. Small of Troy. Private funeral plans are being completed. A photo of Small is here. 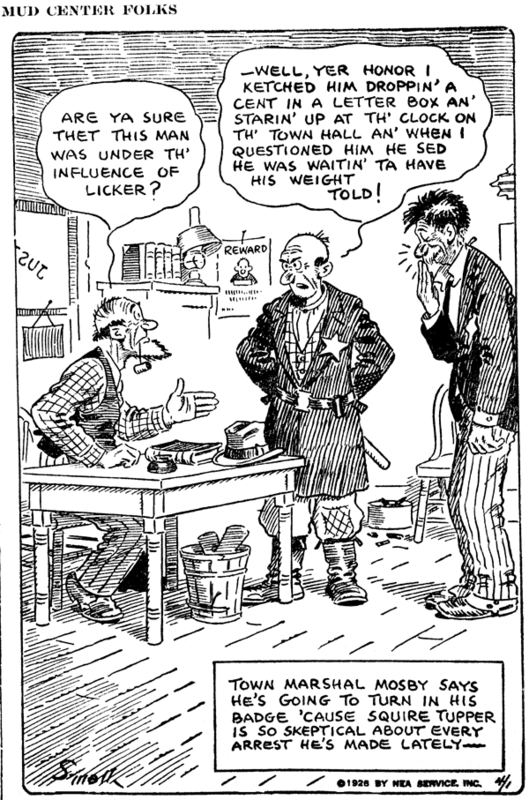 Charles D. Small seemed to always be stuck taking up the slack where other cartoonists left off. 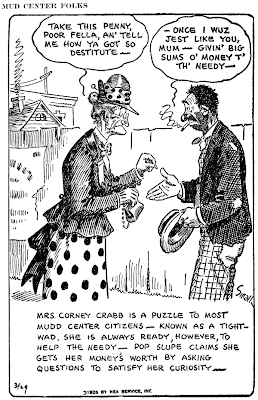 He lived in Cleveland in 1925 and got on with NEA there, and his first signed assignment was Mudd Center Folks. 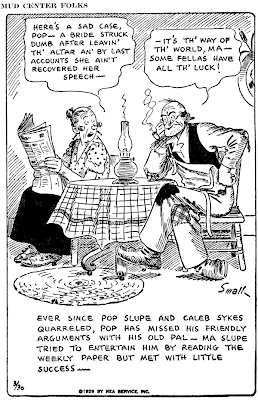 NEA had just lost the panel cartoon series The Old Home Town to Johnson Features and the syndicate had Small provide a replacement. His version was Mudd Center Folks, in my opinion a much superior feature. Small did not follow the lead of Lee Stanley, whose Old Home Town was a rather frantic and slapstick look at small town life. Small instead chose a warmer, folksier approach that owed more to another NEA panel, J.R. Williams' Out Our Way. 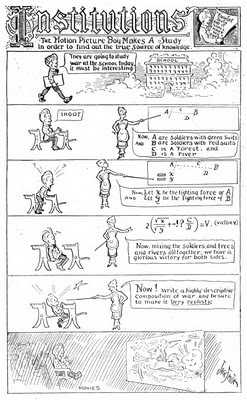 The drawing style is very much like Williams', and the gags are gentle. This excellent feature didn't immediately catch on as a replacement to The Old Home Town. Many NEA clients chose to continue the original feature through its new syndicate, and just how many folksy panels does a newspaper need? Even though Mudd Center Folks came free as part of the NEA package service, it ran in few papers. A shame really. 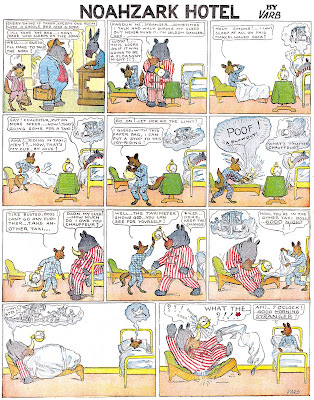 After Mudd Center Folks, Small continued to pick up where other cartoonists left off. There was Bugs, the radio panel, and then the long-running Salesman Sam, in which Small did such a perfect impersonation of George Swanson that you can't tell one from the other without looking for the signature. Mudd Center Folks ran from July 6 1925 to April 20 1926. I found those funny, but think the bottom captions are a bit unnecessary. A New York Times obituary, published October 13, 1935, said Jack H. Smith was 66 when he died; his birth was around 1870. He has not been found in the 1870, 1880 and 1900 U.S. Federal Censuses. In Indiana's Laughmakers (1990), Ray Banta profiled Smith. 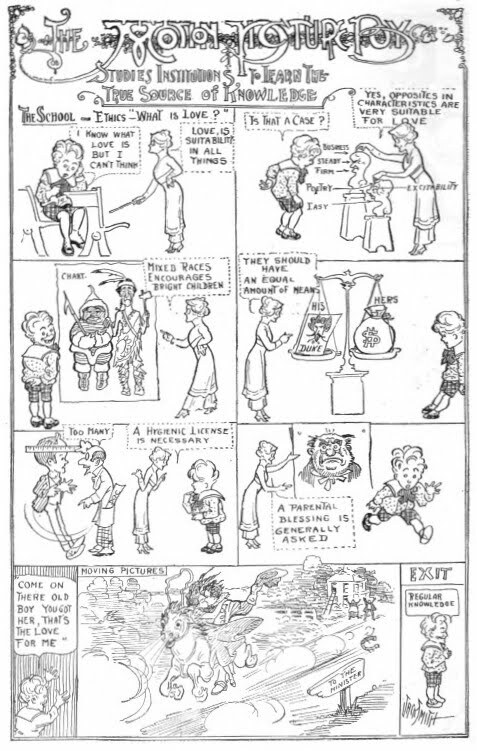 His source was The Sunday Journal (Indianapolis, Indiana) article, "Newspaper Artists and Their Work the Public Seldom Sees," published on December 13, 1903. Banta wrote, "Jack's father, Samuel R. Smith, died when Jack was about five years old. Later, the family moved to Bloomington, Indiana, where Jack and his brothers, Charles and John, entered Indiana University. Jack majored in mathematics, but…switched to philosophy under Dr. William Lowe Bryan. It was at the suggestion of his professor of philosophy that he first submitted his drawings to papers at home and abroad. 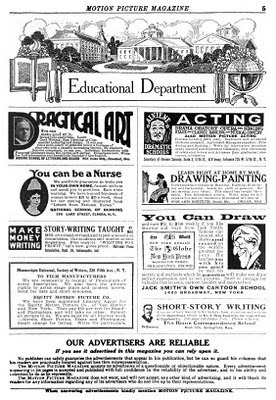 He achieved almost immediate success.…Smith was 'editor, manager, illustrator, and staff, all in one' for the I.U. 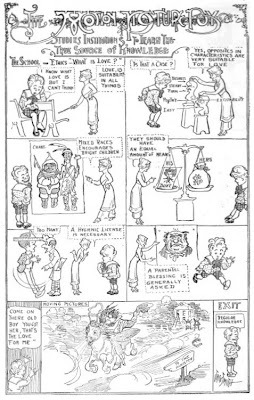 Illustrator, which was launched in November, 1897.…After five years in the university, he came to Indianapolis and became illustrator and cartoonist for The Indianapolis Press.…When the Press discontinued publication, Smith went to the Nashville News as head of its cartoonists and artists. He returned to Indianapolis around 1901 and resumed his career with The Indianapolis Journal." In the 1900 census, his mother, Hilda, and brothers lived in Indianapolis at 1024 Virginia Avenue. Smith gradually moved to the east. His strip Uncle Billy was a Philadelphia product. According to the 1910 census, he and his mother, 65, lived in Manhattan, New York City at 348 West 45 Street. 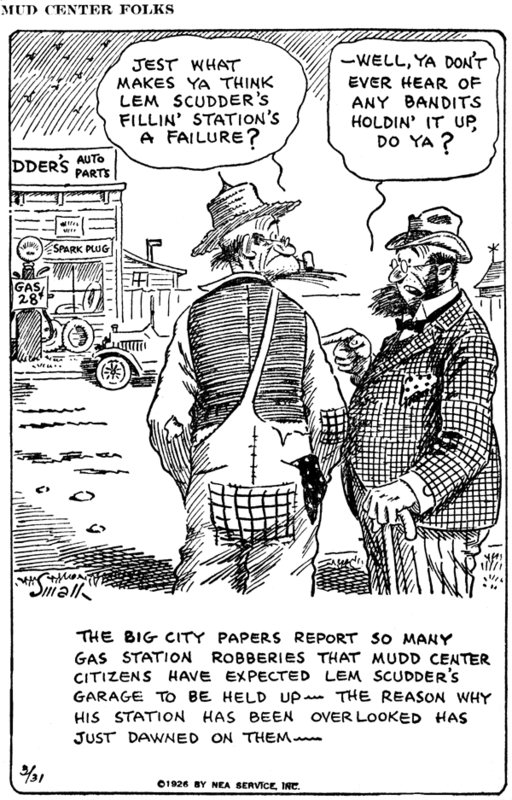 An Illinois native, he was a newspaper artist. Smith produced illustrations and The Motion Picture Boy for Motion Picture Magazine; apparently his work appeared every other month. When the Motion Picture Boy began and ended has not been determined. 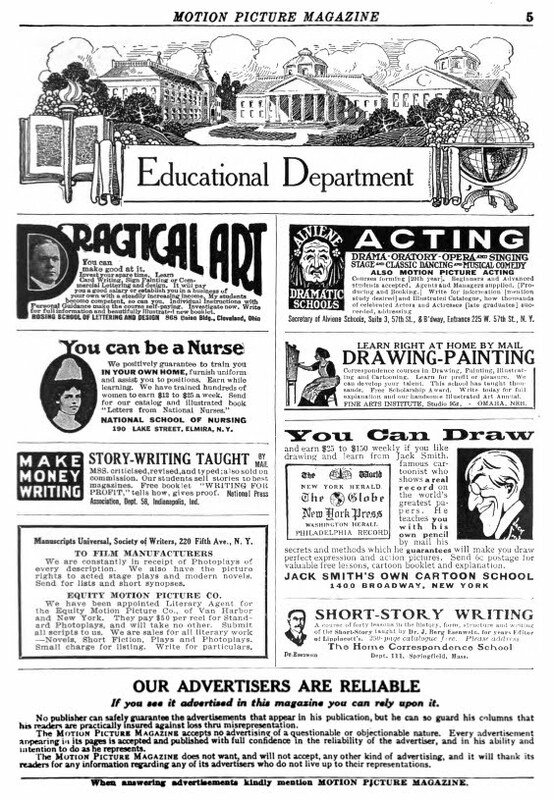 Ads for his cartoon school appeared in the magazine, and other periodicals such as Boy's Life and Popular Electricity and Modern Mechanics. Smith has not been found in the 1920 census. He produced the strip Daddy Dusk, The Sandman in 1927. He has not been found in the 1930 census. Smith passed away on October 11, 1935. The New York Times reported his death two days later. Jack H. Smith, who had been a cartoonist for the old New York Herald and other newspapers, died on Friday, in the Fordham Hospital, Bronx, after an illness of several weeks at the age of 66. Of late years Mr. Smith had conducted a correspondence school for cartoonists at his home, 2122 Bryant Avenue, Bronx. A brother, Charles, survives. 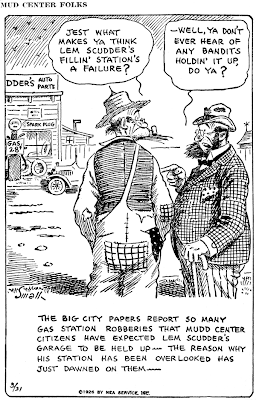 George Herriman made quite the coup as a young unknown cartoonist in 1902 when he landed a berth at one of the most prestigious papers in the country, Pulitzer's New York World. Although he certainly didn't become a star there, he did produce some interesting series. There was little hint of the greatness to come, but this early material certainly displays an excellent knack for slapstick. His first continuing series for the World was Musical Mose, a raucous strip about a black musician who desperately tries to get a good gig with little success. 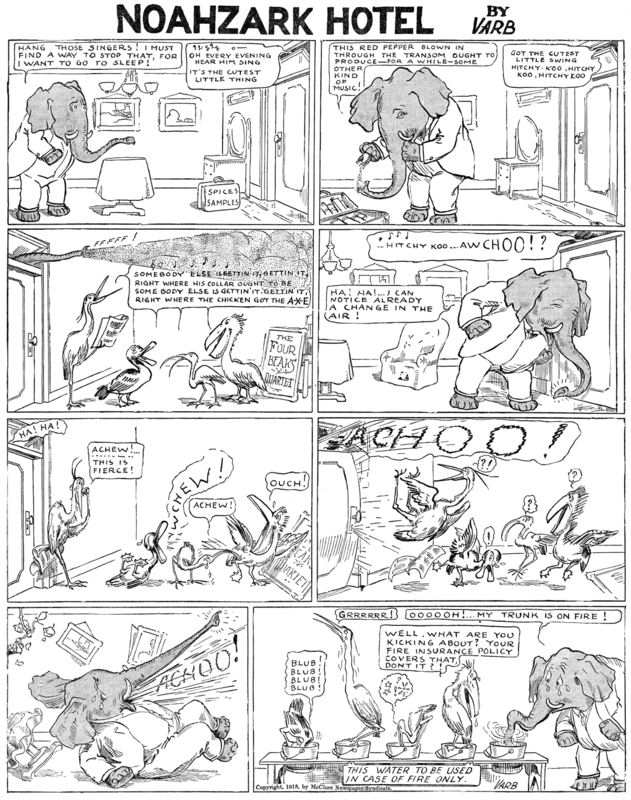 The strip ran for just three wacky episodes, in the first of which the star wasn't even named Mose, but rather Sam. Oh well, details, details. The strip ran on January 19, February 16 and 23 1902.
wasn't there one further episode of Mose, that somehow appeared the North American? According to my North American index notes, Herriman's contributions were limited to one episode each of "Broncho Pete" and "Tattered Tim". 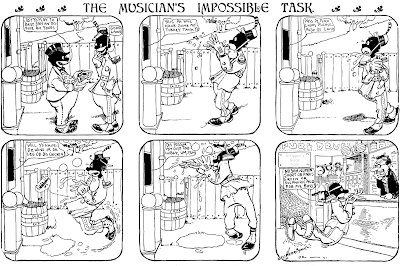 The Philadelphia North American published a Musical Mose on March 9 1902 under the title "No Use, These Days, To Try to Break Into Those Exclusive Professions." (Mose tried to be an Italian organ grinder. It didn't work out so well for him.) 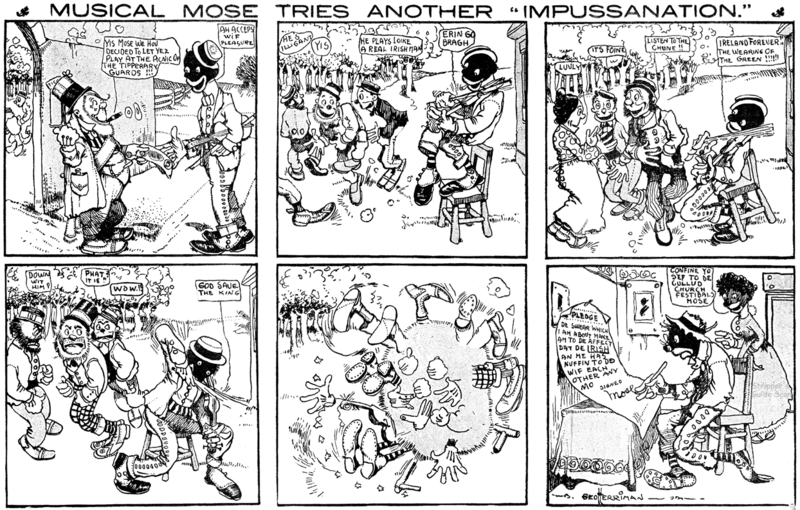 It appears that the PNA published some comics by Herriman that were unique to the paper, but then also picked up work that I see in McClure papers, so maybe that Mose comic was for McClure or some other syndicate? Allan: My gosh I need a rest. Not only have you already posted the PNA Mose, I had already commented on it. Plesae disregard and good night! Found a Mose piano book with music published by Olman Music Publishing, signed by a Sadie Soon over in 1923. Do you have any info about this? I found a framed print that seems to be a music book of some sort that has a character named Mose. It was published by Olman Music Publishing. I can't find anything similar to it anywhere online. Would you be able to assist me? Thank you. I'm usually awake between 4:30 and 5:30 am and Jim already has at least an hour on me. Although I do catch him since I stay up later. LOL.